Home » DMHP » Facilitated self-referral as a case finding tool in outreach clinics. Facilitated self-referral as a case finding tool in outreach clinics. Detecting common mental problems in primary-care via promoting self-referral: A CMHP experiment of influencing pathways to care by solicitation with a symptom list. One out of every five people who attend a primary health centre has one or the other mental health problem. The fact that it does not come to  the clinician's attention is unfortunate. Many reasons can explain this -at the clinician's level (skill acquity), the setting (differentiation of symptomatology), the patient (presentational clarity) and so on. How health-care services can become accessible or inaccessible is one question which public health researchers are particularly concerned about. Pathways to care with its associated filters at the various interfaces of the health-care system is one useful framework to understand how care reaches or eludes the needy. Such understanding can help inform, influence and improve the accessibly of our services. 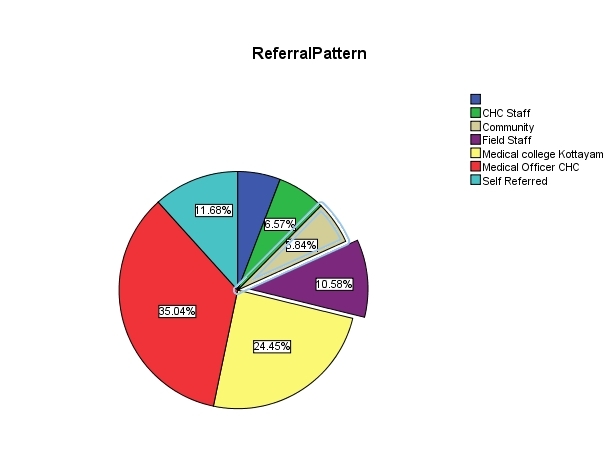 Pathways to care analysis at Community Mental Health Program (CMHP, Kottayam district) informed us that 11.7% of patients (see chart) were self-referred to the clinic. It means they found out about the schedule of the monthly clinics by themselves. They got the  information  by  reading  -the notice board at each Community Health Center(CHC), the newspaper announcement about the clinics, the notice board at the nodal centre (near ward 4, Medical college hospital) about the clinics. We thought of augmenting the self-referred pathway by directly influencing the treatment seeking of people who come to the OPD. A small slip (see picture) which listed common mental health problems  was given to every patient at the OP registration counter at CHCs with a request to meet us at the "counseling room" (https://communitypsyindia.wordpress.com/2014/02/15/). We did it at CHCs where the CMHP had less than 20 patients for followup. We found encouraging results as many patients came forward to meet us at the clinic after reading the slip. Sleeplessness and excessive worry were the common presenting symptom in people who came via this pathway. It is therefore concluded that handing out a slip with symptom list of common mental health problems, at primary care OP is one way to improve detection of minor mental disorders and provide early intervention. Services and access to care can be improved by this simple approach.One barrier that was noted was - many of the older people found it difficult to read the fine print in the slip. By kumarRam in DMHP, Outreach Mental Health Clinic, Services & Policy on June 17, 2014 .